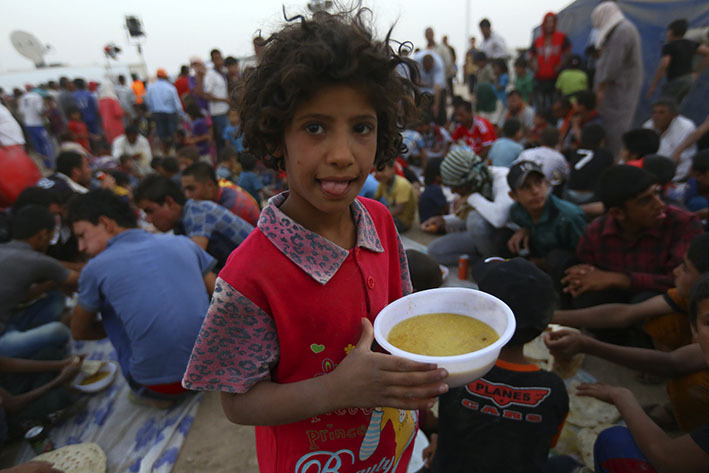 On the move: A child holds a bowl of soup inside the Khazer camp on the outskirts of Irbil, Iraq, in June 29. Chaldean Catholic bishops, meeting for their annual synod in Irbil, appealed for “courageous dialogue” to pull the embattled country out “from the dark tunnel”. THOUSANDS of Iraqi Christians who fled recent shelling by extremist militants and sought refuge in the neighbouring autonomous Kurdistan region are now returning home, said a Catholic archbishop responsible for their care. Chaldean Catholic Archbishop Bashar Matte Warda told Catholic News Service about “90 per cent of the families are returning to the villages of Qaraqosh and Karamlish and environs after they received assurances that the area is once again safe”. On June 28, Archbishop Warda expressed grave concern for more than 40,000 Christians that fled the Christian villages outside Mosul. At the time, most fled with just the clothes on their backs, while some, who were still in their pyjamas – a sign of their panic and desperation – narrowly escaped after militants from the Islamic State of Iraq and the Levant laid siege to the area. As violence continued to plague Syria and Iraq, Pope Francis pleaded for international action to promote dialogue, and he urged Catholics to pray particularly for Iraqi Christians forced to flee in late June. Archbishop Warda told CNS that the Kurdish Peshmerga fighters assured the Christians it was safe to return home. The Peshmerga has fought the Islamic State of Iraq and the Levant and their Sunni Muslim Arab tribesmen trying to gain control of the area. Meanwhile, Chaldean Catholic bishops, meeting for their annual synod in Irbil, Iraq, appealed for “courageous dialogue” to pull the embattled country out “from a dark tunnel” and expressed their fear that a civil war could erupt, breaking apart the country. In a June 26 statement issued during the June 24-28 meeting, Chaldean Catholic Patriarch Louis Sako of Baghdad said the bishops “appeal to all Iraqis responsible for preserving the Iraqi home unity, with its entire components … The bishops urge them to get together and to engage in a courageous dialogue to pull the country out from a dark tunnel which could lead toward the danger of civil war and the dismemberment of Iraq, God forbid,” the patriarch said. The Chaldean bishops called for “speeding up the formation of a national unity government that comprises all components, capable of swiftly bringing about stability, security and ensuring the availability of basic services desperately needed soon, during a hot summer”, particularly, the statement said, considering the June 28 start of the Muslim period of Ramadan, a month of fasting and repentance. “The bishops plead (to) the international community and the influential super powers to assist Iraqis with finding an acceptable political solution which will avoid catastrophe and the destruction of the country,” Patriarch Sako said.